CIC Need Testers for Exciting New Product! The Cerebra Innovation Centre (CIC) are currently working on plans for a new Oxygen Trolley and we are looking for testers. 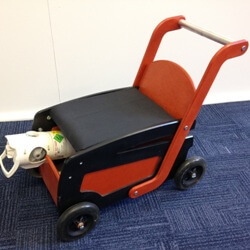 We mentioned in the last newsletter that one of our plans for this year is to develop our little Oxygen Trolley to incorporate as many uses and make it available for as many children as possible. So the plan currently is to make one product that will enable children to transport their own oxygen, ventilator or food pump, and some toys/books etc to make it more inclusive and more of a toy that carries their equipment. 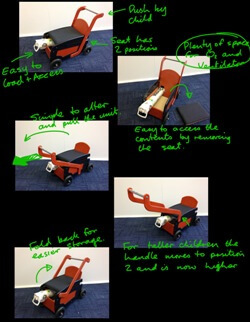 We are trying to develop it so that it can be pushed along and thereby give support as a walker, or pulled along for the more mobile children, and can be sat on to act as a ride-on toy! We have one more addition to make that is not shown here and this is to add steerable wheel to the front for children who are more mobile and stable. Shown below are some photos of the current design. This first prototype is being sent to some very eager Occupational Therapists in the Long Term Ventilation Team at Queens Medical Centre in Nottingham. They are going to assess the product then pass it on to its new owner, a 2 year old boy. The next one is shooting off to Liverpool for the same assessment by the Liverpool team. We are meeting some more OTs in the Royal Bromton Hospital in London and hopefully by then will have the design perfected. BUT… we still need you!! If your child could benefit from this product we would love to hear from you. We need lots of willing product testers to ensure the concept works and to help us iron out any problems. If you think this would help your child, please get in touch and join the fun! Our overall aim is to be able to make a really good product that we will be able to sell commercially and earn an income for Cerebra.